Stealth Website Logger is an invisible, easy to use surveillance application that monitors and records all websites visited by a user or computer. All accessed websites are recorded in a detailed report that can be viewed in web format or sent to a specified email address. 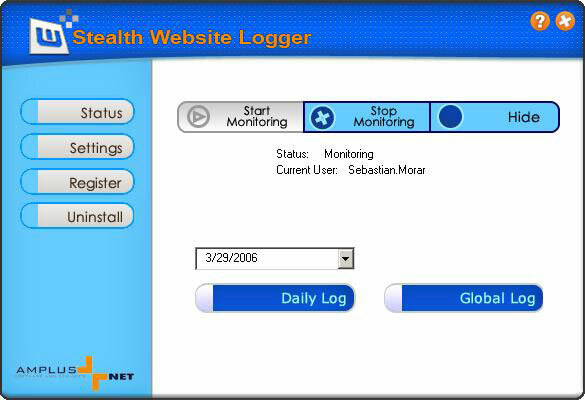 Stealth Website Logger is suited for both office and home use, monitoring one computer or an entire network. Stealth Website Logger interface is password protected . Stealth Website Logger is an invisible, easy to use surveillance application. Fore enhanced security, Stealth Website Logger interface is password protected and requires a hotkey combination for accessing it. When running, Stealth Website Logger is not visible in Program Files and Task Manager. Qweas is providing links to Stealth WebSite Logger 3.5 as a courtesy, and makes no representations regarding Stealth WebSite Logger or any other applications or any information related thereto. Any questions, complaints or claims regarding this application Stealth WebSite Logger 3.5 must be directed to the appropriate software vendor. You may click the publisher link of Stealth WebSite Logger on the top of this page to get more details about the vendor.